There is so much to explore when it comes to our world! So many places to visit, explore and experience. Unfortunately, there are many factors that limit where we can actually travel and see in person. That is one reason why Kids Activities Blog is so crazy about certain apps for kids. Like a great book, a good app can teach and enhance. 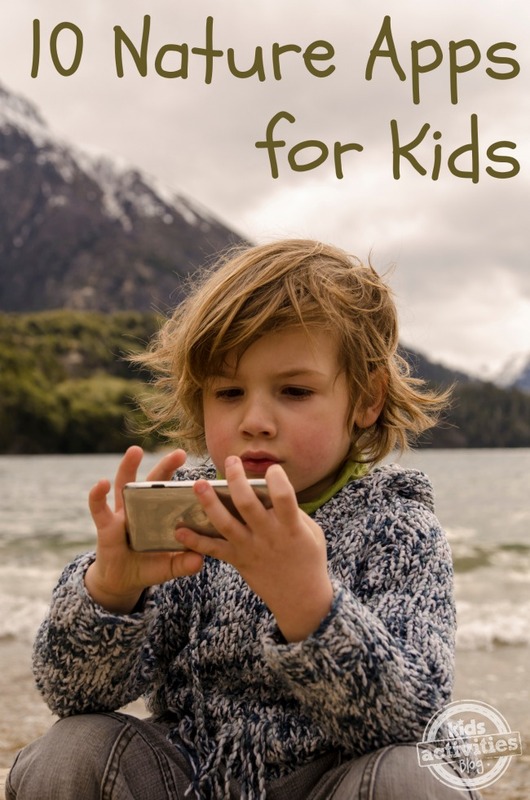 Here are 10 of our favorite nature apps for kids! Audubon Birds, Trees, Mammals and Flowers is by far my favorite Nature App. There are less expensive versions than the one we bought for just under $20 but I have to tell you the money is extremely well spent. We use it daily more often than not when we are outside examining parts of nature. Here technology meets hands on exploration. Some days I take a picture for further research on the app later. Other days we look up the information on the spot. You can log sightings, search real time sightings in your area and keep a journal of your discoveries. My sons love listening to the bird songs and the sounds of the mammals. I love the visuals, where the animals migrate, real life images of the flowers and trees and the range maps. Parts of Plants and Parts of Animals – A Montessori Approach To Botany & Zoology are some of my son’s favorite learning apps. The apps simulate Montessori’s Zoology and Botany puzzles. While nothing beats the hands on experience with these puzzles, these apps make for a great extension to the learning. Simple to use, the app clearly label parts and offers a rich learning experience for various difficulty levels. World Atlas is a National Geographic app that is packed with information about our world. You can search locations and find out just about anything including the current time and weather. It is one of those apps that you can get lost in! Hippo Seasons is a tour guide for kids to explore the seasons. They can interact with activities like crunching in leaves, rolling a snowball and planting bulbs. The interaction is easy enough for littler kids, but older kids may want to peek over to see what is going on. National Geographic Kids has a lot of different apps to choose from. Each that we have used were great. You can choose based on your child’s interests. I like the Weird but True! app. Nature Tap is gorgeous to look at. It is a free app with 28 North American birds, information and even bird calls. There is also more birds, mammals, reptiles & amphibians, insects & spiders as well as wildflowers. WWF Together is a do-not-miss kinda app! It was named as one of Apple’s 2013 Design Award winners. You can interact with amazing endangered animals to discover how they live. There are all sorts of fun facts that will keep you going back for more! Geocaching is great fun and can be an adventure at any place that you might visit. We are always surprised to find that there are things to find almost anywhere we travel…or even close to home. Kids love the hunt! The best “nature app” for a kid is to go outside with someone who knows nature and can teach them about it hands-on! To learn about it on a smart phone is BS. Parents better wake up before their children start referring to the home computer as “Mom” and “Dad”. Share with your child. Teach your child. Take a walk. If you don’t know your “trees” and “plants”, look them up in the Encyclopedia – not on a computer – so your children might learn to do the same. I could read by 3 because I had a mother who read to me constantly. I knew every bush, berry, tree, flower and bug. I knew what to touch and what to stay away from. I was taught what a poison ivy plant looks like and how to tell the difference. Lay back on the grass a look up at the stars or find funny shapes in the clouds. Celebrate a rainbow. Listen to the birds, the bees, the frogs – all of nature speaks! My parents gave me the best childhood because they gave themselves. I couldn’t agree with Susan more. There is nothing sadder than seeing a small child with their face buried in a screen while out exploring nature. I would die if I saw my children looking at an iPhone while we were hiking in the Rockies. The idea is to disconnect from this frenetic world and reconnect with nature, not to keep up the pressure to constantly do, learn, and be more connected at all times. If you want your child to learn about the flora and fauna in your local ecosystem, pack a lunch, some binoculars, and a field guide (yes, the book kind) and go for a nature walk WITH YOUR CHILD. The apps are wonderful for kids who have severe allergies, live in cities, or want to explore another area. What about kids trapped in medical facilities who can’t explore. I’ve lived where it was dangerous for my son to be outside bc of allergies and asthma and the doctors didn’t know what was making him sick. Turned out to be a reaction to a volcano. Technology isn’t going away. Instead of being rude about a posting for apps, gently remind parents all things need balance. Kids need a balance of technology and natural learning. Giving kids power to learn on their own is true education. While I think it’s great to make note about some of these apps, they should not be a replacement for actually getting out and doing activities out of doors. As a former environmental educator (and current childcare provider), I place an exceptionally high value on place-based education, outdoor activity, and explorative learning. @Bridgette: As an educator, I have worked with city kids, children with severe allergies, children with mental or physical disabilities, under-privileged kids, and more besides. Nature is free, unlike a lot of these apps. It is accessible to anyone and everyone that decides to enjoy it. City kids have zoos, parks, playgrounds, and urban gardens to explore and appreciate. Children with allergies would and have benefited from outdoor experiences. Children with mental and physical disabilities often thrive in an outdoor environment. While I understand much of the statements above I can also appreciate that technology can be combined with exploration. I would hope that we aren’t so blinded by our own opinions of how everyone ought to be parenting that we fail to see and respect the ways that other (wonderful) parents may be teaching and investing in their children. I am constantly looking for new and “outside of the box” activities and appreciate reading this blog/list Holly. I’ll be the first to say that my children are not allowed to have their faces buried in a screen while we’re out exploring. I love their faces too much to see that happen. Thanks for the tipps, great apps! I have an iPad and only a few apps for my kids on it. I sometimes allow them to play but I try not too often. Of course, it shouldn’t become an habit. AMEN LORI!!! am absolutely certain that this post was shared and published by educated and responsible Mothers/Parents. Its common sense to me as a parent and reader, the apps shared about here are just wee added pieces, a small part of the bigger parenting picture. Come on now… I believe there are educational, informative apps out there for children to use: with parental discretion. Unfortunately or fortunately, just like video games came in no parent liked them, these apps, and others will now be a part of your child’s future, ready or not! Just like computers are all part of our working worlds. Besides, NO Where in this post did the parents suggest you give this app to your child while they ‘run to the local pub for a drink’! And, Wow. I am shocked to see negative comments like this,on a child’s activity site in the first place?…really? These look really exciting! I love having guide books and references with me when we go hiking and camping, but they become unwieldy at a certain point. I love in-the-moment learning when we’re out and about! Looking forward to adding some of these apps to the learning and discovery tools already in my toolbox. I also agree with Lori. Technology can be a wonderful learning aid. The author does not suggest you replace hands-on outdoor experience with these apps. She suggests you use them to enhance it: whether your child uses the iPad after a camping trip to learn about the things he saw, or even during a hike. Frankly, that is up to the individual parent and has nothing to do with your opinion or mine. Dear Susan and Stacey: how nice that you apparently have the nature knowledge (seriously, Susan — only those who happen to know the local nature guru are doing it right?) and/or the strong backs to carry multiple field guides along with the rest of your gear when you go out hiking. I used to do that, because that is how my parents taught me, and because there is nothing like being able to figure out what bird/plant/berry you are looking at as you are looking at it. Then I got injured, and couldn’t carry books anymore. So I’d take a picture of whatever it was, and look it up later. Not the same. But then — along comes the smartphone, and suddenly I can carry a camera and a notepad and a field guide or ten, even a sketchbook…all in one lovely little gadget that fits in my pocket. And when my little guy comes along with me, he gets the same great immediacy of learning that my dad shared with me. And I should point out that smartphone screens are not easy to see outdoors; you have to tuck them into the darkness under your jacket. Nobody’s going to be spending their hike with their nose stuck in their gadget, anymore than they would spend their hike reading.